At his grand campaign rally in Gelora Bung Karno Stadium earlier today, presidential candidate Prabowo Subianto mocked his opponent – the incumbent Joko Widodo or Jokowi. Prabowo claimed that his opponent’s ‘magic cards’ will not solve anything. Prabowo also tried mimicking the current President’s voice. “Our economic growth reaches five per cent,” said Prabowo, imitating Jokowi`s voice. “Well, that five per cent is nonsense!” He stormed. He reiterated his stance by saying that the government may have built a lot of infrastructure, but the people need jobs and not “magic cards”. Prabowo’s sole rival, Jokowi has long expressed his initiative to launch three “magic cards” if he gets re-elected. The three cards are: the Smart Indonesia Card, which will finance students; a cheap groceries card; and pre-employment cards. “We need jobs, not cards,” Prabowo exclaimed. 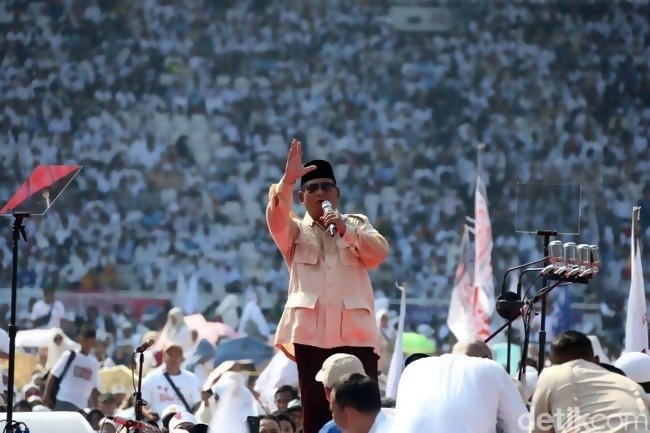 A number of national figures who are supporting the Prabowo – Sandiaga Uno ticket were also present at the grand rally. Some of those in attendance were: PAN politician Amien Rais; Chairman of the Prosperous Justice Party (PKS) Assembly, Salim Segaf Al-Jufri; PKS President Sohibul Iman; and PAN and MPR (People’s Consultative Assembly) Chairman, Zulkifli Hasan.